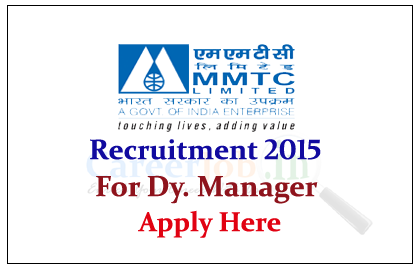 Metals and Minerals Trading Corporation of India (MMTC Limited) is recruiting 2015 for the post of Deputy Manager for the year of 2015. Eligible candidate can apply here on or before 30th June 2015. MMTC was Established in 1963, Metals and Minerals Trading Corporation of India (MMTC), one of the two highest foreign exchange earners for India, is a leading international trading company with a turnover of around US$ 10 billion. Eligible Candidates can apply online on or before 30.06.2015, for more details check official Notification.